Please contact us at directdamage@outlook.com for any inquiries. All shipping is done with 72 hours of the order. If the order is placed while we are closed or the post does not run, we will have it out the next day. Orders are shipped using USPS. All sales are final. To be considered for an exchange, you must contact us within 48 hours of receiving your order; requests will be evaluated on a case-by-case basis. A 15% restock fee may be applied. Question : What is Direct Damage LLC? Answer : Direct Damage LLC or Direct Damage Games is a small business that does collecitble and miniature games. We buy , sell, and trade in Magic the Gathering and Pokemon Collectbles and also have done many games from Wizards of the Coast, Fantasy Flight Games, Wizkids , and Games Workshop. Question : What condition are the cards in? Answer : All cards we purchase pass through a grading process. Please see the card condition guide for more details. If you have any questions in regards to the grades please contact us at directdamage@outlook.com. We are happy to answer any questions you have. Question: Do you buy magic and pokemon cards? Answer: Yes we do! We offer competetive rates in Cash and Store credit for singles and collections. We are also interested in Video Game Systems + Games , collectible action figures , toys or statues, and sealed magic/pokemon product. Question: How do I sell to Direct Damage? Answer: We prefer for you to just come on down to the shop but if we do have the Buy List enabled you can submit what your selling via our Buy List and mail or bring it down. However the preferred method is to just bring your stuff in during business hours. Trade ins on NON BULK recieve 50% Store Credit Bonus! Please make sure all cards are NEAR MINT (We buy Played bulk at 50% of the listed price), English, Sorted Facing the same way, and have the valuable cards separated from bulk. We have a buyer available to go through collections on a case by case basis during retail hours. Trade ins recieve 50% Bonus as in Store CREDIT! We are happy to take a look at any magic , pokemon, miniature, or video game collection. - Cash paid on the spot for most gaming/toy collectibles that we can sell on our website or any selling platform like tcgplayer for cards or ebay for everything else. We buy new and used product , card collections /singles , miniatures, and video games. - Our buy rates do vary from a bulk rate (*see below) up to 60% cash or 90% credit. - On average we pay 40% cash or 60% in store credit. - We use a variable scale for our buying rates. Items valued under a few dollars are considered bulk and rates are different between game types and demand (*see below). - We offer an additional 50% as store credit when trading in ! Some Math on how we pay , we have a BUYLIST and we are ALWAYS buying so we have a scale on how things work. We also pay competitive Rates on used Video Games ! If you are viewing this page you are in Buy List mode and can use the search bar to see what we our average cash over would be for Magic and Pokemon cards (video games is currently under construction however we prefer you to just bring in your stuff). Cash on hand is limited to $500 a day so if selling us a collection that is valued at more than a grand please contact us ahead of time. The preferred method for selling us cards is in person. Please come in atleast 1 hour before closing time and if you do submit a online list (please do not mail it , just bring it down). Thank you and we look forward to seeing your great collections! These are the base rates we pay with minimal verification. - We prefer cards to be free from binders , pages , sleeves , and any damaged / tip cards need removed. Please have no more than 10% basic lands or energy per 1000 cards. - We only accept bulk cards in english print and in Near Mint / Lightly Played condition (Moderate Play and Heavy Play are only accepted on a case by by case basis) . - Store Credit bonus available only NON Bulk items that we Buy. - We do have tables and boxes available for you to sort out your cards. Please use them ! I've even made a balance sheet to better help get a count of your cards and we have easy methods of counting them. - if you want paid - please make sure to follow our requirements. 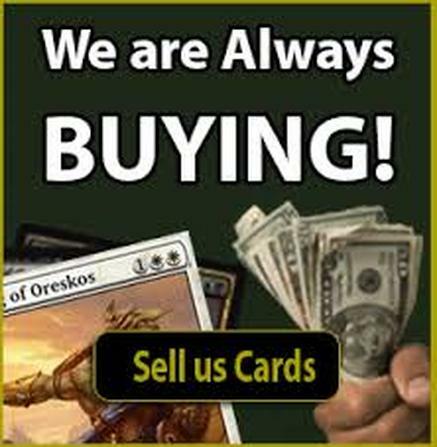 Magic the Gathering : Always buying and rates do vary by value and condition. Cards valued under a few bucks are bought at a bulk rate and buy rates start at 40% on cards up to $25. Over $25 we buy at 50%. Cards in Moderate Play to Heavy play are accepted on a case by case from all sets throughout magic. Pokemon : Always buying rates do vary by value and condition. Cards valued under a few bucks are bought at a bulk rate and buy rates start at 35% on cards up to $7 , $7 to $25 we buy at 40% , over $25% we buy at 50%. Pokemon collectors are very picky so we are no longer able to accept cards in heavy play and have are now much stricter on what we can accept in moderate play. Video Games : With the Nintendo Switch we are looking into adding Video Game events and starting to stock the like ! We are interested in buying any working console and games. Nintendo , Playstation, or Xbox . Retro to new , let us make you an offer. We are also interested in X-Wing Minis, Generation 1 Transformers toys , and almost anything Nintendo related ! The Prices you see are for Near Mint. We do grade cards and we grade heavier on the more valuable cards. Near Mint we buy at 100 % of the price shown , Lightly played we buy at 80% to 90% of the price shown, Moderate Play we buy at 50% to 60% of the price shown, Heavy Play we buy at 25% to 40% of the price shown.